Mildly sweet and crunchy deep fried bits. A snack for evening or to munch for no reason at all. Has a good shelf life. So you can make it and store it for Diwali or before guests are expected. This sweet is usually made of maida but I made this with whole wheat. Heat a pan and add water and jaggery. Heat until the jaggery dissolves completely. No need to bring to boil or thicken into a syrup. Filter the diluted jaggery to remove any impurities. Take 2 cups of wheat flour, cardamom powder, roasted fennel seeds, and mix well. If you are adding baking soda, you may add now. This will make the shakkar para crispy. Heat ghee to melt it. Add ghee to the flour mixture. Mix well. Add the jaggery syrup in small quantities, mixing it into the flour. Knead the flour to make a smooth dough. If the dough is dry, you may added small quantities of water. Keep aside to rest for for an half hour. Take small portions of the dough and shape into lemon-sized balls. Use a rolling pin and a smooth surface to roll them into thick chapathis. You can use dry wheat flour to dust the surface. Can be a little tricky as the dough is very dense and a little sticky because of the jaggery. Use a dull-edged knife to cut the chapathis horizontally and vertically to cut them into diamond shapes. Place a thick iron wok on fire and pour oil into it. When the oil is adequately heated, drop the diamond shapes into the oil gently taking care not to splash oil. Keep the flame low. Due to the presence of jaggery, the shakkar paras could get really dark. When they start turning darker and gets roasted, remove from oil and place on an absorbing paper to drain oil. Fry the remaining diamond cuts in batches. Cool and transfer into an airtight container. 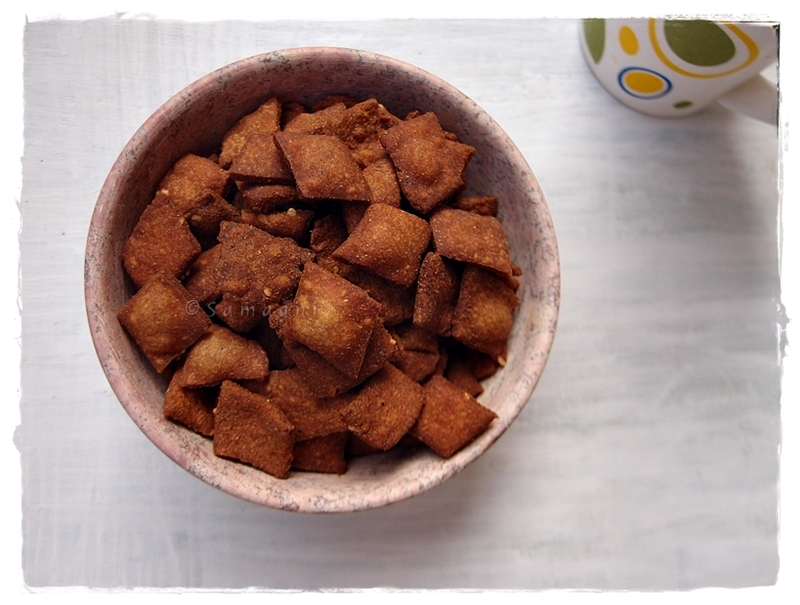 Note: You can make salty and spicy variations by substituting jaggery with salt, chilly powder, and asafetida. Kesari bath/sooji halwa is one of my favorite sweets. It is a common neivedyam (food offering made to God) and a sweet served along with breakfast at Palakkad Iyer weddings. It is made even when there is no special occasion but just to satisfy sweet craving or when you have unexpected guests. It can be made easily, does not consume time, and most people love it. The best kesari bath that I have had is at Iyer weddings and at the Juhu ISCKON temple. Mani’s Cafe (next to Palakkad Jn railway station) serves melt in the mouth kesari bath. Palakkad Iyers add a little bit of pacha karpooram (Borneo-Camphor/Kacha Karpoor) and this gives a nice smell and taste to the kesari bath. Yellow or red food color is also added to this recipe but I do not prefer this. The traditional kesari is warm, greasy, soft, and has a melt in the mouth texture. It has oodles of ghee that adds to its taste yet it doesnt drip ghee. Many a times the amount of ghee is cut down in homemade variations of kesari bath. Water, ghee, and sugar proportions are critical to make the perfect kesari. Too much water, sugar, or ghee can spoil the taste and consistency of the kesari. Although I have seen my mother make this dish very often, I always get confused about the quantity of water to be used for this dish and for upma. I referred to this blog to make this recipe and my kesari came out just right. Add the saffron strands to a small cup of warm milk/water and keep aside. Add half a cup of ghee to a thick bottomed wok and let it melt in medium heat. Turn down the heat to minimum and add the cashews/raisins/almond pieces and roast until golden brown. Remove them from the ghee and keep it aside. To this ghee, add rawa and keep stirring until the rawa turns color to golden brown. This will take about 5-7 minutes. I like to roast the rawa to golden brown although it is sufficient to roast just until the rawa starts to change color. While roasting the rawa, boil water in a pan. If you are adding milk, ensure that you use 1 cup milk and 1-1/2 cups of water. Ensure that that amount of water and milk put together is not more than 3 cups. Turn down the heat and add this boiling water/milk to the rawa cautiously. Make sure that you stand a little away from the stove while doing this as it might splutter. Stir this and make sure there are no lumps. Cook this for about 2-3 minutes. When the rawa is cooked and the water/milk content reduced, add sugar and mix well. The sugar starts to melt and the mixture once again becomes a little watery. Cook until the mixture thickens and water content reduces. Add the remaining ghee and stir. Add cardamom powder, cashew/raisins/almond pieces, and saffron dissolved in milk/water. I prefer to have kesari bath warm although you can refrigerate this and serve it cold also. P.S. (added July 14th) – I tried making kesari bath with jaggery instead of sugar and it turned out to be really nice. So had to share it with all of you. The method remains almost the same. Measuring jaggery can be slightly tricky and if you use blocks of jaggery, you will need to make a wild guess. One thing you can do is pound the jaggery blocks and measure it using the same cup you used to measure the rava. Water should be three times the quantity of rava used. Soak saffron in a tablespoon of warm water. Keep aside. Dissolve jaggery in three cups of water. Using a strainer, strain this mixture to remove any dirt. Keep this water-jaggery mixture on the stove on low fire. Meanwhile, pour ghee into a thick bottomed pan. Keep fire on low. Put the cashew, rasins and almond pieces into ghee and roast the dry fruits. Remove the dry fruits from ghee when they turn golden brown and keep aside. Note that if you are using almonds, you will need to either soak them in water for 3-4 hours or blanch them and then peel and cut into smaller pieces. In the same thick bottomed pan, to the melted ghee, add rava and roast on low fire for 4-5 minutes until rava changes color to light brown. When the rava has lost its raw smell and you start getting a finely roasted smell, add the jaggery water mixture which is kept on low fire in the next stove. Stir and add the hot jaggery-water mixture. The mixture starts to bubble and thicken. Add the soaked saffron. Keep stirring until moisture content reduces and the mixture starts to leave the sides. At this stage, you could add one more tablespoon of ghee. This is entirely optional and adds more sin, glaze, and taste to the kesari bath. Add cardamom powder and roasted dry fruits. Mix well. Jaggery kesari bath is ready. This is slightly more healthier as compared to the sugar version. Kerala’s very own sweet. Quintessential Kerala ingredients; rice, coconut, and jaggery; are used to make this unassuming sweet. Popping an ari unda into your mouth after a meal can be an utterly satisfying experience and the best part is that you can do so without feeling sinful or guilty. It is a very healthy sweet since it is devoid of oil, ghee, or sugar. It is a very good gifting option also as it has good shelf life and can be enjoyed by all age groups. In a thick iron wok, dry roast the grains (rice, wheat, and mung beans) separately until they change color and start giving out a wonderful aroma. In case of rice and wheat, they will start to pop. Green mung turns brown. Rice and wheat takes roughly 10-15 minutes of roasting time each in medium fire. Remove from fire and allow the rice to cool. Grate coconut and powder the jaggery. In a mixer, grind the rice into a powder, not too fine but not very coarse either. If you are using whole dry ginger, powder it along with the grains. Add the elaichi pods along with the rice while grinding. Keep two tablespoonfuls of powdered rice aside. After you finish powdering the rice, add jaggery, grated coconut and some powdered rice into the mixer jar and blend well. Remove from the mixer jar and mix the powdered rice, jaggery, and grated coconut well. The moisture from jaggery and grated coconut moistens the rice. If you are using dry ginger powder, add it now. Using dry ginger adds a nice flavor and aids digestion. Make balls out of this mixer and use the powdered rice that you kept aside to coat the moist balls. This stays good (in normal temperature) only for 4-5 days because of the presence of fresh coconut. However, you can refrigerate this for up to 15-20 days. Another version that is made traditionally in my house involves mixing the powdered rice with jaggery syrup. This version uses copra instead of grated coconut and hence has a good shelf life of 2-3 weeks. The only downside to this version is that due to the use of jaggery syrup, depending on the consistency of the syrup the laddus harden and breaking them with your teeth can be quite a task! Some jaggery varieties are not moist enough to hold together and firm up the laddus. In such cases, you will need to use jaggery syrup instead of powdered jaggery for the laddus. Make jaggery syrup by adding a cup of water to the jaggery and heating it. When the jaggery is diluted, strain it to remove impurities. Then, boil the strained jaggery syrup to a string consistency. Turn off the heat. Add small quantities of this syrup to the mixture of powdered grains and coconut/roasted copra. Add enough to moisten the powder and then use your palm to shape into laddus. You can roll the shaped laddu on some dry powder to firm it up a little bit. Make sure that the jaggery syrup that you add to the powder is warm enough. For this, you may have to reheat the syrup depending on the time you take to shape the laddus. But you cant keep the syrup on flame all the while that you are making the laddu because that will make it too thick and sticky. A fitting follower to Ela Ada, my previous post. The ingredients are the same as ela ada. Just that the proportions are different and they are mixed differently. These are little steamed pouches of a mixture of rice, jaggery, jackfruit jam, and coconut. Steamed and oil-free, one can truly indulge in them without guilt! In my household this dish is called Enna Pothi, which literally means Oil Pouches, though I cant figure out why it might be called so since no oil is used in this dish. Enna could also mean Numbered. Any of you can crack the name puzzle, please write to me. It is intriguing to think how our ancestors came up with different recipes using the same ingredients and how different and unique they taste! Ela ada are very sweet while these sweet pouches are only mildly sweet. Different households have different styles of making it. Some use banana leaves to make the pouch, some use cinammon leaves. Since I could not find a suitable leaf, I chose to steam them in the idli mold. It is a regional variant you see! The amount of jaggery and jackfruit jam are more of personal choices. You can add as much as you like and it would turn out just fine. Method: Grind the raw rice into a smooth paste. Add the jackfruit jam and jaggery pieces and blend it in the mixer to make a smooth and evenly mixed paste. You could make jaggery syrup and then add it to the rice flour and jackfruit jam and blend it well using a spoon. But using the mixer to blend these three ingredients ensures a smooth consistency and gives good results. Keep the batter aside. Heat ghee in a pan and add the grated/cut coconut to the ghee and roast till the coconut turns golden brown. Turn off fire and add the roasted coconut to the batter. Add elaichi powder. Mix well. Note that if you are using an idli mold, the batter needs to be of idli batter consistency. But if you are using a leaf, you will need a thicker consistency for the batter. If you are using banana leaf, tear out square or rectangle portions of banana leaf. Pour one ladle full of batter into a piece of banana leaf and close it neatly from all sides and tie with a thread. Cinnamon leaves are small and it is a challenge to stuff the batter in them. Hence if you are using cinnamon leaves, the batter consistency should be thick so that it does not ooze out. You need to be able to stuff the batter in between the leaf and pin the ends of the leaf together. If you choose to use an idli mold, lightly grease the idli molds with ghee. Pour one ladle full batter into each idli mold. Steam in a pressure cooker for 10 minutes. Turn off fire, take out the idli mold from the pressure cooker, and let it cool. After they cool down a little bit, the sweet pouches start separating from the edge. Use a spoon to lift the pouches off the mold and place on a serving plate. Soft and spongy sweet pouches (in this case, idlis) are ready! People in different parts of India celebrate each festival in their own unique ways. In South, Makara Sankranti is a harvest festival. One of the items made with the newly harvested rice is Sharkara Payasam or Sweet Pongal. Back home we do not have any festivities for makara sankranti. My memories of sharkara payasam are associated with the last day of Navaratri (Vijaya Dashami). My cousin, who was the main pujari for this puja, would make sharkara payasam on that day. He did not resort to any measurements, but each time it turned out to be a delicious treat and we were left asking for more! Clean the rice and cook it well. Make sure that you drain the extra water from the rice. Dissolve the jaggery in water and strain it to remove any impurities. Pour the melted jaggery into a thick bottomed pan (preferably uruli) and bring to boil. Add the cooked rice to the jaggery. The jaggery should not be too watery when adding the cooked rice. If it is, then by the time it thickens, the rice will harden. Stir occasionally. When it thickens and water reduces add elaichi powder. Roast the coconut pieces and cashews in ghee. Add this to the cooked payasam and its ready! My cousin would sprinkle generous amounts of kalkandam (crystalized sugar) to the payasam along with ghee. This makes it a truly heavenly treat. If you add moong dal to this payasam, it becomes sweet pongal. You can check out the recipe here. Note: The jaggery should not be too watery when adding the cooked rice. If it is, then by the time it thickens, the rice will harden.